Once again this year I was asked to create an art display celebrating Hispanic Heritage Month (Sept 15 - Oct 15)... and man was I excited to get started! The majority of the students at my school are Hispanic... so getting to dive a bit further into the culture and it's art is especially exciting for our kids! 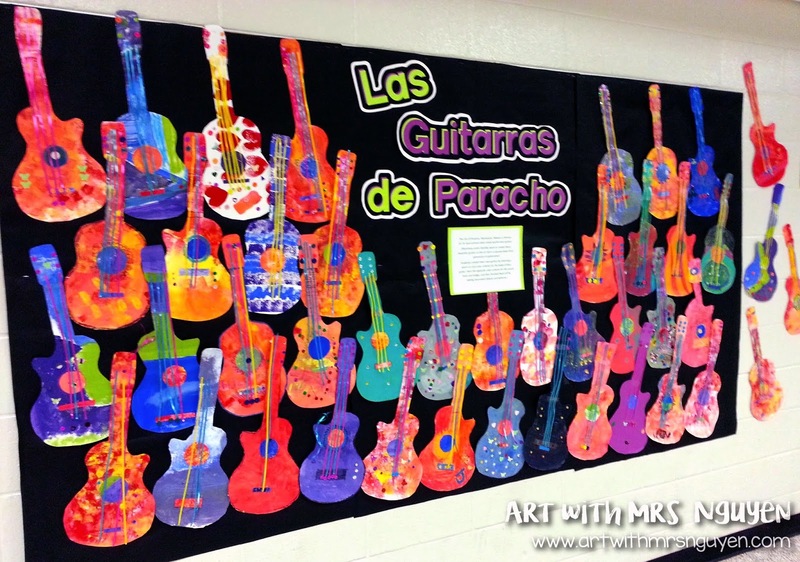 This year I had a ridiculous amount of ideas for projects celebrating the culture (thank you Pinterest)... but had to narrow it down.. so I went with Aztec Suns, Zapotec Weaving, and Guitars of Paracho (inspired by this pin from Painted Paper Art). To begin the project I started with my usual PowerPoint presentation (posted on slideshare) giving the students some background information before the art-making began. We talked a bit about the economy of Mexico and attempted to figure out how Mexico could be ranked as the 2nd richest country in Latin America... and at the same time be the Latin American country with the 2nd greatest amount of poverty. The kids came up with some interesting answers... but eventually we landed on the explanation that a small group of people in Mexico own the majority of the country's wealth (making it a "rich" country) while a greater amount of the population lives in poverty (estimated at 44% of Mexicans). We looked at a map visually illustrating the poverty levels in Mexico and found that closer to the United States border less people lived in poverty than in Southern Mexico. 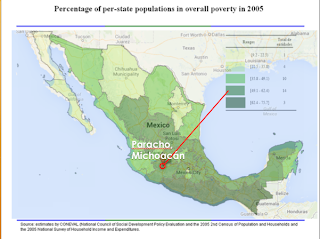 Then we focused in on Paracho, Mexico; a city located just 2 hours south of Guadalajara. 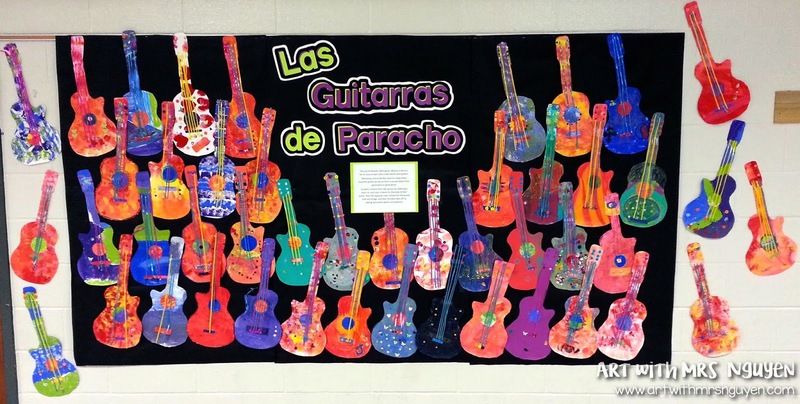 The interesting thing about the city of Paracho is that it is said to have more guitar-making artisans within it's population of approximately 17,000 people, than in the entire United States! Guitar making is a tradition passed down from generation to generation and is a source of income for the people of Paracho. The guitar-making also attracts a bit of tourism for the city as it hosts a Guitar Festival each year. 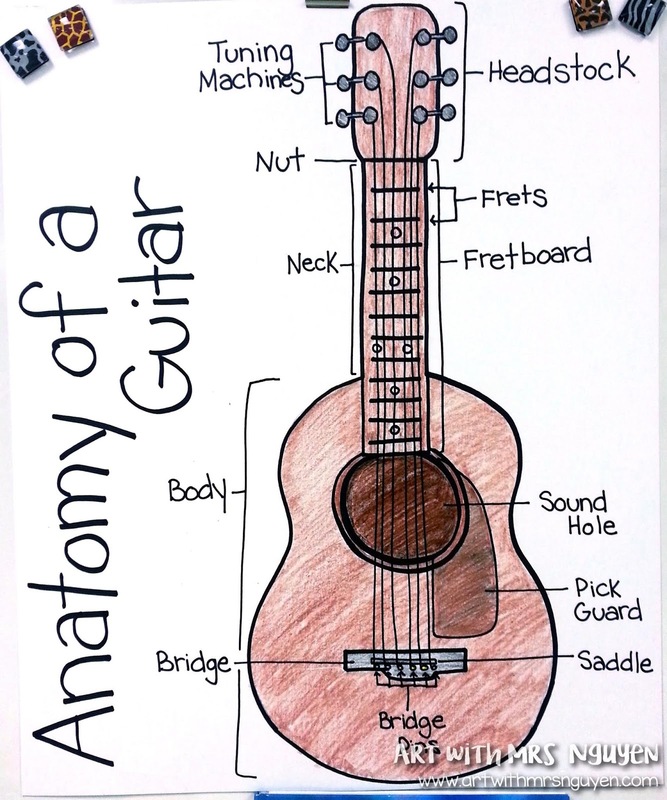 Next I showed my kids two clips I found on youtube which highlights the guitar-making in Paracho. The videos are in Spanish with English subtitles... but that just got my kids even more excited (since most of them speak Spanish)!! Below is one of the videos (I claim no ownership). So inspired by the fine artisans of Paracho and the bright colors and patterns of Mexican art, we got started with our project! 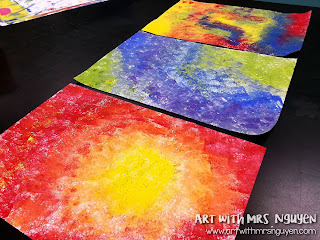 I reviewed warm and cool color schemes with my students, then had each table select one or the other to use for their sheet of 12"x18" painted paper. Instead of just painting it though (which is still super awesome)... I wanted to do something different with the kids... so we sponge painted it! Was it a giant mess? Yes. Was it a pain to try to scrub like 30 tempera-paint soaked sponges clean? YES. Was it crazy enjoyable for the kids? Absolutely. The next day I had the kids create the body and headstock for their guitars with their painted paper by tracing a stencil I made. I normally DESPISE using any kind of stencil/tracer... but for this project I thought it would be necessary (especially since I knew they were going to be displayed for Hispanic Heritage Month and time was of the essence). 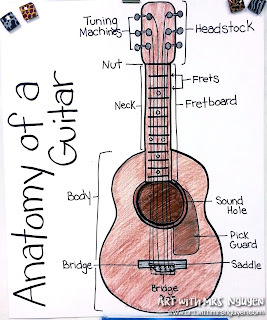 Next I had the kids swap paper scraps so that they had paper of the opposite color scheme (to create a bright contrast) to create the sound hole, bridge, and any other details they wanted to cut and paste. 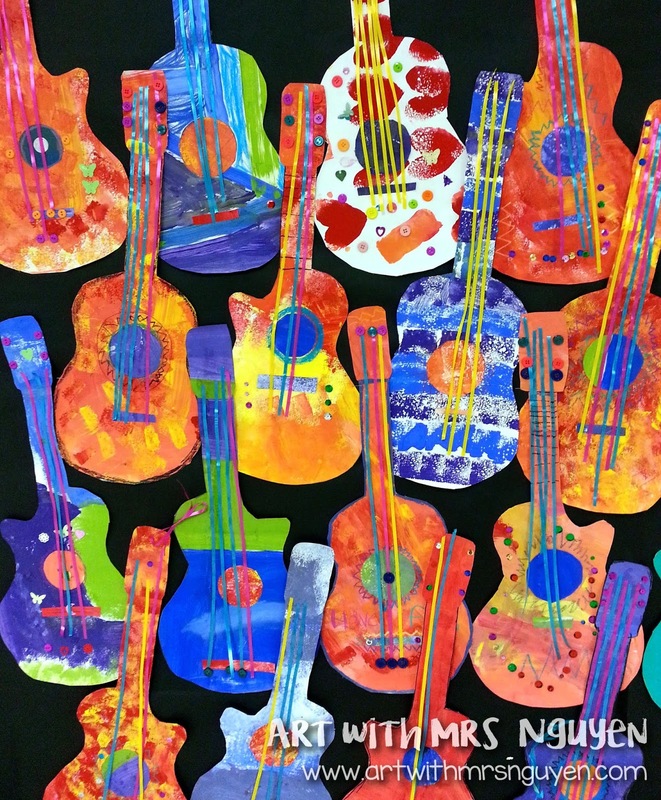 Once the shape of the guitar was fully assembled, students had construction paper crayons and color stix to add any additional color or pattern they wanted. The next day I let students choose what color "strings" (pieces of gift-wrapping ribbon) they wanted to use, gave them sequins and buttons, and then let them go to town!